Cement grout mixer is the specialized development, the design and construction of production from liquid and powdered materials and absolutely uniform, colloidal dispersion suspension. Slurry blender can be used for water, cement, bentonite and additives. High speed water mud mixer is especially used for foundation works, mines, tunnels, deep drilling. Colloid mixture of cement grouting can also be used in soil nails. Efficient hybrid, provides a quick mixing cycle, it can save a lot of time and labor. 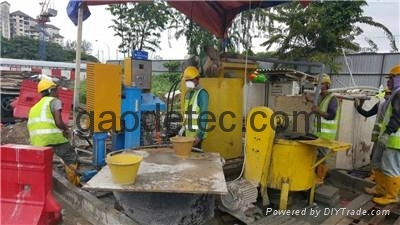 Grouting machine is usually cooperation with slurry blender, mixing materials, slowly to prevent separation. Mixed slurry is quickly and easily. Hybrid technology is almost the same the world famous brand suppliers in the United States, Switzerland and Germany. Capable, trustworthy China cement grout mixer mining suppliers lease email: info@gaodetec.com for more information.